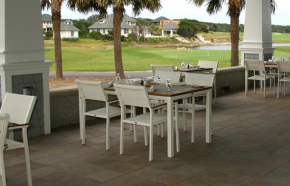 Bald Head Island Club information for visitors: golf, pool, tennis, dining, fitness, Pro Shop and more. Please contact the Bald Head Island Club golf shop at 910-457-7310 for all your golf questions. 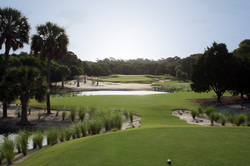 The Bald Head Island Club's golf course is a natural wonder in and of itself. Redesigned by Tim Cates in 2009, the course meanders along beautiful saltwater marshes and includes incredible ocean vistas. For vacationers, there are temporary memberships to the Club, for an additional fee, when you rent accommodations with a golf, sports, or social membership(vacationers can rent from a social member, they just can't access the golf course). The Golf Shop stocks an array of men’s and women’s golf apparel, golf equipment, and shoes as well as croquet apparel and equipment and general Club apparel. Let one of the golf professionals assist you in finding the right piece to make your golfing experience complete. The golf shop offers club fitting, re-gripping services, as well as an array of group and private instruction. The pool facilities include a heated 25-meter pool, a slide for children 10 and under, showers, plenty of poolside seating in both shaded and sunny areas, and a poolside deli affectionately called the “Peli”, for its delicious, well priced food. The scenic “Peli Perch” deck offers awesome views of the Ocean, the most relaxing breeze on the island – and it’s a great place to eat breakfast, lunch or dinner. While at the aquatics complex, guests are invited to take in a round of beach volleyball or let the little ones entertain themselves at the adjacent playground. Towels are provided at the pool. The Club asks all pool visitors to bring proof of membership with them to expedite the sign-in process. The tennis program generally runs from April through November. The Club’s 4 tennis courts were resurfaced in 2009 with a soft surface that’s easy on the joints, but won’t change the spin of your ball. The professional staff offers daily clinics, social activities, private lessons, and programs for children 3 years old and up. The tennis pro shop features the hottest tennis apparel, shoes, equipment, racquet restringing and much more. Rental equipment is also available upon request. The Club’s fitness center is a busy place to be. Offering an array of cardio and strength training equipment as well as free weights and exercise balls, the center is more than adequate. Open daily year round, the fitness staff offers small group training sessions or one-on-one personal training. The Club’s championship croquet greensward is considered home to some of the nation’s top players. Whether you're a beginner or a seasoned veteran you'll find the Bald Head Island Club's greenswards a beautiful venue for the genteel sport of croquet. If you’ve never played, try a lesson or a clinic while you're here. There may be a minimal fee to use the greensward and equipment, depending on membership type. Every island visitor must experience the beautifully open clubhouse while enjoying a meal that you won’t forget in one of the four distinct dining venues. Club menus vary from venue to venue and include an array of regional seafood specialties, seared-to-perfection steaks, pub type sandwiches, hearty soups and salads, and desserts sure to complete the experience. Throughout the year, the Club’s experienced culinary team entices visitors with specials, Sunday’s impressive brunch, not to mention the weekly specials that can be found at the Peli throughout the off-season. The Club Food & Beverage Department would like to remind our members and guests to keep in mind that the reservation times for a la carte and special events book very quickly. Please take the time to plan ahead and make your reservations early!